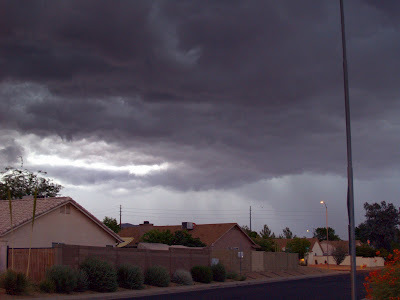 Since this blessed evening of rain, garage chatter, chilling air, and thunder parties, Leanne and I have been going back and forth about writing this blog entry. I voted and decided that she go ahead and write this entry and I would provide the pictures. You know....kind of like a newspaper. She could be the journalist and I'd be her sidekick photographer. However....comma (That was for you Nan) after reading her entry, ready and waiting to just copy and paste it to my own blog I decided I'd give you my take on the evening because you know...there's always two sides to every story. 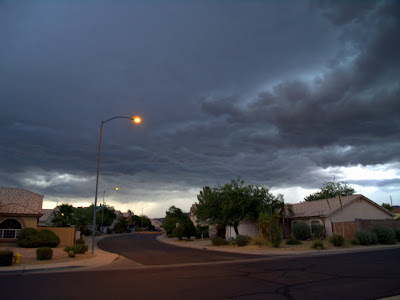 We finally got our first official Monsoon storm on Thursday the 10th... and boy was it crazy!Here's how the evening went... The temperature during the day was a humid 104. The clouds had been building and we had a 'slight chance of rain' in the forecast. So, naturally we were trying to not get our hopes up this time.Around 7:30, Emily and I walked out of Chris and Denee's to oogle at the spooky clouds that had been building towards the North. If something didn't come from those low-lying, black, fluffy clouds, I would have been really disappointed! So far so good....you were spot on with the story so far Nan. 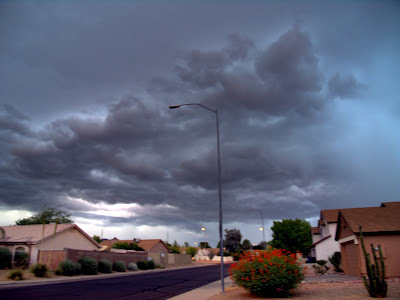 The temperature had dropped about 20 degress in less than an hour... somethin' was a brewin! Denee grabbed her camera and took a few pics...Emily and I decided it was time to head home and finish up our errands. As we began to walk home, when it started to sprinkle a little. We were so excited to get a sprinkle or two! Chris: Oh my Gosh it's coming in fast we better make a run for it! Denee': (Oh brother he has my child....I dont wanna be home alone and miss the thunder party) Go, go, go here comes the cloud!!!!! ......felt the need to scream from two houses away, in a deperated, panicked yell, "Run! Run for your lives everyone! It's coming! Save yourselves!!" We all laughed at him. In fact, I'm pretty sure the entire neighborhood was laughing.As we kept walking, we were only in front of my mom's house at this point, the sprinkles came a little harder. So we called Grammy to come outside and enjoy it before it stopped instantaneously like it usually does. By the time we reached the middle of her lawn, the sprinkles had turned into REAL RAIN! Yipee! We walked into Grammy's garage and found Papa there too. We all enjoyed the rain from inside the garage. The rain had turned into cooler drops and the temperature had dropped at least another 5 degrees in a couple of minutes. This was the first rain Jayda had ever played in and everytime Chris would run out of our covered shelter in the garage to give her a seconds worth of soaking she'd lose her breath. So funny! We didn't want to go inside, because the rain we get here only lasts about 3 minutes and then it's done. Leaving us with muddy windshields and hot, humid air. And then... it began.The rain bands in the sky began to wave in the clouds a short distance away. As we stood to admire them, the bands waved our way. The temperature dropped another couple degrees and it started to pour. Not just any downpour. Lightening and thunder and rain so thick and wet, we could barely see the hill across the street. We stood inside the garage because the lightening was fierce. Just then the sky to the northeast lit up into a haze of purple and green and orange. As if someone had let off their fireworks too late, and too low. More lightening and more purple and green sky. Somewhere a transformer must have been hit or a power line. That light was not natural! During all the popping in the sky and transformers blowing, the conversation then led to adult mean talking about Transformers the movie just from the mention of the word......boys will be boys, and then to Chris turning into Bill Ny the Science Guy telling us how all the power on the street was out. Chris: WHOA did you see that? All the power just went out everywhere. Tom: (in a mocking cool voice) Really? Cause I'm pretty sure that's some light coming from inside Grandpa's house right behind you if you turn around. Tom: .......ummmm I don't think so, Isn't that the street lamps right there that are all on? The rain was coming from the sky like waves in the ocean. It couldn't pour down fast enough! The oil on the street was bubbling a white froth and the water soon came up to the sidewalk. Nothing was draining fast enough. The storm drains couldn't swallow the water quick enough to save the street from flooding. The grassy retention basin across the street was already filling. The bottom completely covered now. Then, Chris noticed that there were cement bags in the garage getting wet. Not good. We still didn't want to go inside. We might miss the show! So we called Grandpa and Grandma to open their garage door so we could run inside and enjoy the rain storm with them. Afterall, it would be over in a few minutes... right?Emily had been carrying around her umbrella all day, JUST IN CASE. So NOW, she wanted her umbrella. It was still in the car. Being the great mom that I am, I decided to sacrifce myself and go to our car to get it for her, so we could walk over to grandma's. I braved the pouring rain. Walking out by the house, I had to pass the corner of the rooftop. It was like going under a waterfall at Disneyland's Grizzly Rapids. But, I was still semi dry. Then I almost slipped a little. The ground was so slick. I walked carefully to my car. The driveway had become a rushing river from the backyard. The water was pouring under the gate, the gate almost acting like a dam trying to keep the waters back. I got to my car and the rain was falling horizontally, so I had to walk around to the other side, trying to save some from going inside. It didn't work. I got the umbrella. By this point my clothes were pretty wet. By the time I made it back to my mom's garage, I looked and felt as thought I had been swimming in a pool. My hair was soaked, my clothes, soaked through. But it felt great to be cool!!! The rain drops were ice cold and it was wonderful! So we made our venture over to grandma's garage. Most people would head inside after this kind of weather, not us! As we walked outside, the temperature had dropped somemore and now it was cold! I helped Emily hold the umbrella, trying to cover as much of her face and body as possible from the rain. She just closed her eyes. We were walking against the rain and wind and we could barely see. I was holding the umbrella close to her little scrunched up face trying to block some of the pouring water. I was laughing so hard at the sight of us, I could barely walk and breathe. To the right of us, Chris and Denee and started over and we ended up with a Cinderella situation. By the time we reached Grandma's garage, which is only next door, we were all soaked to the bone. We looked like drowned rats. Hair, makeup, clothes, all soaking, dripping, smeared and flat. We decided to hop in the Suburban and take a rain drive! So Tom ran back home and brought over the taxi. With a few lunchables, towels and blankets, we set off to enjoy the rain! Roads were flooded, there was debris in the streets everywhere! The retention basins were full to the top. We saw a car under water caught in a flash flood. We later found it was a friend of ours. Some Samaritans we are. Major roads like Brown were flooded curb to curb. It was fantastic!We had a blast. After the rains kept coming, and more roads being blocked off to flash floods, we decided to go home and dry off. Everyone was beginning to shiver at this point and the girls and seen enough!We headed home, unloaded and check the backyard. The west side of our house was flooded too. All the grass was underwater and much of our patio was as well. Good thing it didn't last all night long! A neighborhood up the road had so much mud the pavement the next day was covered and it looked like an unkept dirt road. Even the news stations came out to report on it. Every wash had been cleared out and mud and trees and rocks were everywhere. Even part of Chris' front yard had washed down to this end of the village.What a great storm. We got 3.04 inches of rain from that storm that rained for only a couple of hours. Last year, we got 3.44 the whole year. It was a much needed, powerful, fun and fabulous monsoon. I like the story!! Great description. I'm glad we were in Mesa that night. We attended a wedding reception and drove down Brown to Ellsworth road in that. Bad idea! My poor Avalon made it through but it was close! 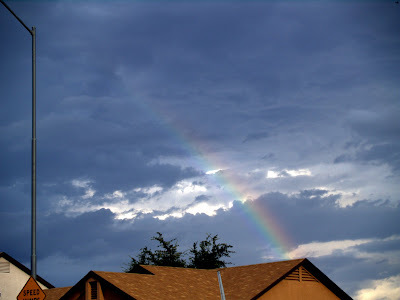 When we got home (Queen Creek), no rain. It rained through the night though. 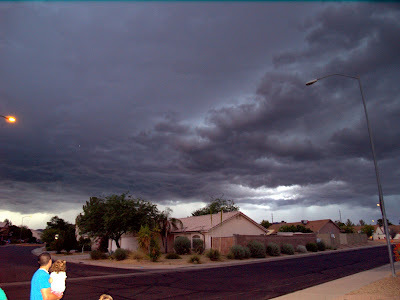 Loved that monsoon storm! We got caught outside in it too trying to put things away so they wouldn't get rained on. By the way, saw you last night (7/15) on 3TV. You guys were at the Loop 202 opening and I saw Jayda in her "Barbie Mobile"! So cute!